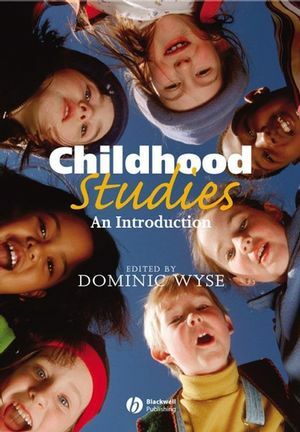 This text introduces students to the key issues in the study of childhood, from infancy through to adulthood, from an interdisciplinary and multi-professional perspective. A broad-ranging introductory guide to key issues in the study of childhood. Approaches childhood studies from an interdisciplinary and multi-professional perspective. Presents the basics of psychology, social welfare, education, health, law, culture, rights, politics, and economics as they relate to children. For each discipline, the role of relevant professionals, such as social workers, nursery teachers, paediatric nurses and child lawyers, is also considered. Contributors have both practical and academic backgrounds in a range of specialist areas. Each chapter includes an independent learning activity, case studies, a glossary and annotated bibliography. Will inspire debate in the classroom about childhood issues. Dominic Wyse is Reader in Primary Education at Liverpool John Moores University. Part I: Children And Childhood:. 1 Inter-Disciplinary Perspective: Histories Of Childhood: John Clarke (Liverpool John Moores University). 2 Self-Concept: Nicola Leather (Liverpool John Moores University). 3 Attachment: Nicola Leather (Liverpool John Moores University). 4 Peers: Dominic Wyse (Liverpool John Moores University). 5 Family Structures: Robert Banton (Liverpool John Moores University). 6 Parenting: Jane Baker (Hugh Baird College). 7 Parental Separation: Robert Banton (Liverpool John Moores University). 8 The Nature/Nurture Debate: Nicola Leather (Liverpool John Moores University). 9 Cognitive Development: Nicola Leather (Liverpool John Moores University). 10 The Development Of Language And Literacy: Dominic Wyse (Liverpool John Moores University). 11 Mental Health: John Harrison (Liverpool John Moores University). 12 The Sociology Of Childhood: John Clarke (Liverpool John Moores University). 13 Childhood And Juvenile Delinquency: John Clarke (Liverpool John Moores University). 14 Sexuality: John Clarke (Liverpool John Moores University). Part II: Children And Services:. 15 Inter-Disciplinairy Perspective: Children’s Rights: Dominic Wyse (Liverpool John Moores University). 16 Overview Of Social Welfare: Ali Mekki (Liverpool Social Services). 17 The Role Of The Child And Family Social Worker: Ali Mekki (Liverpool Social Services). 18 Child Abuse: Robert Banton (Liverpool John Moores University). 19 Overview Of Children’s Education And Care: Nell Napier (Manchester Metropolitan University). 20 The Role Of The Early Years Practitioner: Ainé Sharkey (Liverpool John Moores University). 21 National Curricula: Nell Napier (Manchester Metropolitan University) And Ainé Sharkey (Liverpool John Moores University). 22 Play: Nell Napier (Manchester Metropolitan University) And Ainé Sharkey (Liverpool John Moores University). 23 International Perspectives In Early Years Education & Care: Ainé Sharkey (Liverpool John Moores University). 24 Overview Of Health: Robert Banton (Liverpool John Moores University). 25 The Role Of The Health Visitor: Robert Banton (Liverpool John Moores University). 26 Overview Of The Legal System: Angela Brennan (Liverpool John Moores University). 27 Legal Personel: Angela Brennan (Liverpool John Moores University). 28 The Children Act 1989: Angela Brennan (Liverpool John Moores University). 29 The Legal Status Of The Child: Angela Brennan (Liverpool John Moores University). Part III: Children And Society:. 30 Inter-Disciplinary Perspective: The Demonisation Of Childhood: Dominic Wyse (Liverpool John Moores University). 31 Toys And Games: Nell Napier (Manchester Metropolitan University). 32 Children’s Literature: Russell Jones (Manchester Metropolitan University). 33 Visual Art: Nicholas Medforth (Liverpool John Moores University). 34 Multimedia: Dominic Wyse (Liverpool John Moores University). 35 Ethnicity And Race: Russell Jones (Manchester Metropolitan University). 36 Disabled Children: Jane Baker (Hugh Baird College). 37 Poverty: Jane Baker (Hugh Baird College). 38 Non-Government Organistions (Ngos): John Harrison (Liverpool John Moores University). 39 Children Working: Nicholas Medforth (Liverpool John Moores University). 40 Research With Children: Dominic Wyse (Liverpool John Moores University). Appendix 1: Further Reflections On The Activities.